Most of us will probably never have to go to a life raft. Nevertheless, it is advisable to be prepared in case of need, to react properly even in tricky situations and to keep calm. It is a proven fact that trained seafarers have significantly higher chances of survival in emergencies. A Sea Survival Training is a must for professional sailors and a valuable and possibly life-saving supplement for everyone else. 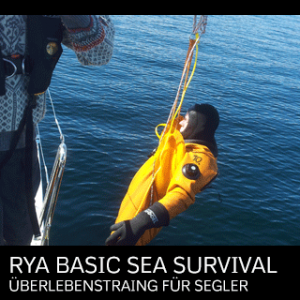 In our RYA Sea Survival Training with Pool Session you’ll learn survival techniques, boarding a life raft, emergency equipment and life jackets, medical aspects of marine survival, and search and rescue techniques. All participants should be physically fit, healthy and able to swim. Please bring your own CLEAN heavy weather gear, including boots, and if available your personal life jacket with you. A basic nautical understanding would be a benefit, in order to profit maximum from our Sea Survival course. RYA courses are mainly held in English – oral English skills are prerequisites for successfully completing the assessment.